For more than 30 years, Cadalyst has delivered insight, advice, tutorials, and tips to help our readers optimize the software and hardware that power the CAD workflow. Cadalyst Video Picks Featuring Lynn Allen — Twice-monthly e-mail newsletter delivering tutorials, product updates, and other CAD-related videos. CAD Manager's Newsletter — Twice-monthly e-mail newsletter focusing on CAD management and implementation advice and strategies. CAD Tech News — Twice-monthly e-mail newsletter covering developments in hardware and software technologies related to CAD, plus industry updates, expert perspectives, and more. Cadalyst.com — Cadalyst's network of Web sites for CAD management, AEC, and manufacturing offers a 24/7 online resource for AutoCAD tips, code downloads, and tutorials; technology trends and updates; magazine and e-newsletter archives; industry events; case studies; and much more. 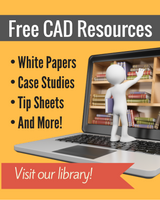 CAD Tips — A popular archive of thousands of reader-submitted CAD software tips and AutoCAD customization code. Longitude Media is a business-to-business media company and publisher of Cadalyst magazine and its associated digital properties. Longitude Media provides information, services, and products that help our target audiences excel at their jobs and deliver the highest-quality leads for our customers.